The Russian Blue baby is a young full of contradictions. In the same way his outer appearance changes, his nature does also. The Russian, he is nearly somebody else every day. Whoever sees him during the first months of living cannot believe that this small live wire with the disorderly coat someday becomes a graceful cat in tender silvergrey. Looking at us out of his skyblue eyes with a melting view it is hard to imagine that these eyes will shine with a very intensive green and a slight melancholy glare in a few weeks. The small Russian runs through more development stages as other catkids do, he lives different lifes at the same time. There are days that he rubs gently full of love and softness through the flat, raises gently his paw, keeps his talons inside, gives us his small head and dots us carefully our legs. A few times later, however, he rushes through the room like a panther, slips through the human partner´s trouser leg and gets his way up there. This heated phase in the young Russian´s life already starts before the 8th week and almost stops not before he becomes one year. For more than four months the keepers experience one surprise with this little live wire after another. Suddenly it becomes a teeth baring, hissing beast that just offered us his fluffy silver stomach a short time before. A few minutes later there is a philosopher instead of the small beast sneaking around our legs, with big eyes, the brows slightly knitted. The small tongue sometimes appears out of the mouth just because of thinking. His first move at the age of 12 weeks the Russian Blue mostly reflects with a bit of panic, he is running around restless for hours, is looking for his brothers and sisters, his mother and the used environment, is a bit stranged to the new people and innocent shy. After two days usually the phase of glowing love starts. He picks out one person who will become his one and only. Always following him wherever he or she will go, not obtrusive, but gently and persistent. Hanging on his lips, who makes him saying that gentle „Mi“ if he is speaking to him. For sure, the Russian also accepts the other two- and four-legged which live with him. But these will get to know the devil in him much more often. To his loved man, however, he is nearly ever an angel. A good educated Russian Blue baby is neither aggressive, nor anxious, nor too dependent on its people. 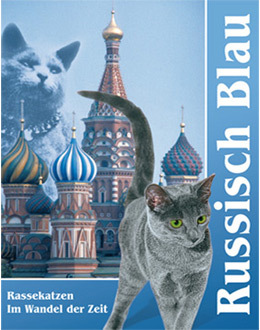 Especially in the sun you have to watch the elegant and light Russian Blue cat. The light makes her coat shining, the tip of the nose and her paws silverly powdered. Also wonderfull the jade- or emerald green eyes, they nearly never squint and don´t water. The coat is very dense, like thick velvet, silky and soft. The characteristic silver effect exists because of the nearly unnoticable colourless of the end of the hair. The devil in the angel comes out especially in free nature when the Russian discovers and lives out his natural hunting shoot. For hours he can wait for his booty with the patience of Job and then seizes the opportunity. Just once, but very accurate without giving his booty any chance. During the fight he often jumps up lots of feet what proves his litheness and impressive musclepower. It´s a catrace that has no equal.